A few weeks ago our women’s ministry team decided to distribute a survey to assess what our women were looking for from our team in the next year. We’ve also heard a lot of women mention that they miss our evening Bible study offering. What better way to find out how great the interest really is than to ask! Our team was divided about whether or not a printed version of our women’s ministry survey was necessary. Our compromise was to offer both. Perhaps your team has been faced with a similar dilemma. Is it necessary, as it was 10 years ago, to offer a printed version of a survey? 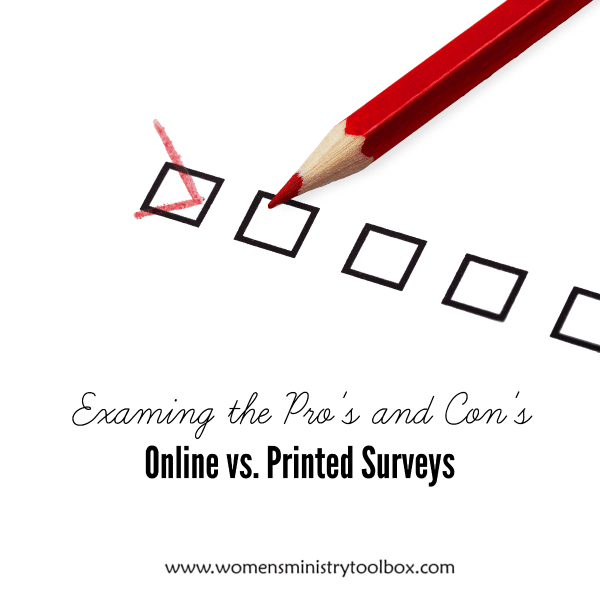 What are the benefits of offering an online survey vs. a printed survey? This post walks through what we discovered during this process. We did our best to ensure that both versions received ample publicity. As the creator of the survey I have first-hand experience of the pro’s and con’s of each version. Let’s look first at the pro’s. You can probably already see where this is headed! Were the “con’s” as out of balance? Yes, they were! You may have noticed I did not list internet access as a “con”. Ten years ago this would have been an issue, but internet access is rarely an issue anymore. So how many of each survey did we receive? Of the 50 – 12 were printed surveys and 38 were online surveys. Click the link below to open a free PDF. Please gather and glean – take what is helpful for your ministry and use it! The online version was exactly the same except for the fact that I was able to require an answer before they could move on to the next question. A very few respondents typed “n/a” as their response to the open-ended questions. If I had to do it all again, I’d be willing to do both, if and only if, our team still felt strongly about putting out two versions. If, however, you had a large event and could give women dedicated time to complete a printed survey, I would definitely do both. You’ll far increase your responses, although you may find them to be less meaty than those gathered online. Definitely take into consideration your situation and circumstances at your church – what worked for us may not be best for your church! 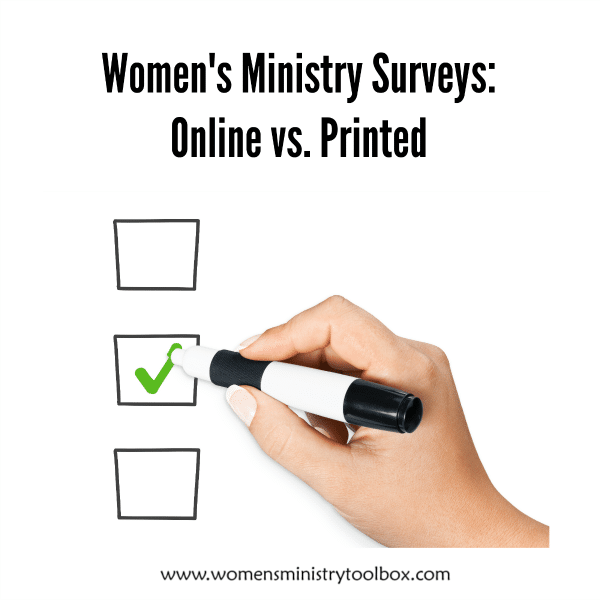 What has been your experience with distributing women’s ministry surveys in your church?